Why is Egypt the 2nd largest economy in Africa? Economists argue it's because the South African economy is not doing so well. 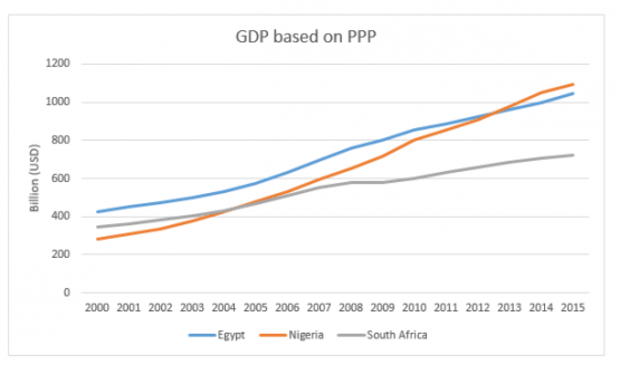 The biggest news in the African Economy arena this week was how Egypt's economy surpassed its South African counterpart to become the second largest economy in Africa after Nigeria. The news was announced by the International Monetary Fund (IMF) in its World Economic Outlook Report that was released in April, However, we needed to understand what does that mean and how did it happen. The answer was offered by economic analysts in a report released by KPMG and comments on it by leading international economists. South Africa is facing an economic crisis, foreign investment is declining due to concerns about corruption within the administration. The South African currency, the Rand, was subjected to depreciation reaching more than 50% between 2012 and 2015. This happened while the Central Bank of Egypt has struggled to keep the Egyptian pound under strict control. Economists commented that both Nigeria and Egypt have very large population growth (173 million and 82 million respectively) and this is expected to reflect on large economic growth. However, South Africa, with a population of a little over 52 million, managed to always be the biggest African economy. Until Nigeria rebased its economic indicators in 2014 to become an African giant. The report argued that South Africa remains a more developed and more diversified than its Egyptian counterpart.